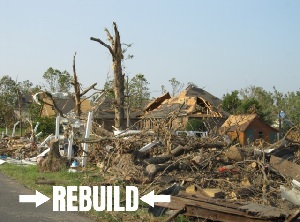 This week Michael is asking us to consider the notion of Rebuild. My life was a mess in the late 80s, but I turned it around and rebuilt it. I’m not going to write about that though as it’s old news. Nature is wonderful. It is also heartbreaking, and as by-standers sometimes there is little if anything we can do to help. There were swans on the large drain a short distance from the cottage. This particular pair was a new mating, probably two years old, and learning the ropes so to speak. This is not a very good picture as it was taken with my old camera in May 2014, but these are the pair in question and they had made their nest on the junction where two waterways met. The pen was sitting on five, possibly six eggs, the cob in close proximity to protect her. Every day we would walk along the lane with the dog and see them together, getting more excited at the prospect of seeing cygnets before we moved away. At the time we had no date yet, but as it turned out, we would only be there for another four weeks. The rise and fall of the water level can be manually controlled, and one day we were dismayed to see both swans valiantly trying to protect their clutch from rising waters due to heavy rain. The following day, the nest was abandoned, the precious eggs still inside. 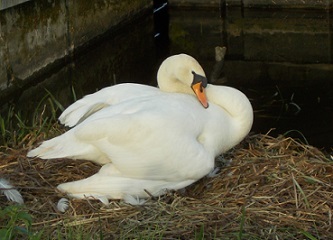 A day later, we saw one swan, again trying to bank up the nest, but to no avail. We were gutted, especially as it could have been avoided if someone had flicked a switch. We learned from the locals that this was not unusual, neither was it unusual for the first clutch of a new bonded pair to fail. What amazed us was that the week before we moved away, we saw a new nest, much higher up the bank, though there wasn’t a swan sitting on it. They didn’t give up, had learned from their mistake and rebuilt elsewhere where it was safer. This too apparently is not unusual, though a second clutch in the same season is doubtful. One of the wonders of the marina was actually seeing the resident swans raising their broods. Yes, I got extremely excited when we realised the pen was sitting on a clutch of seven eggs. I was almost orgasmic when they hatched, even though it was only six. Sadly, only three survived. The mortality rate of water fowl, geese, ducks or swans, is high due to predators such as herons, herring gulls, and a thirty pound pike which was caught and thrown back! 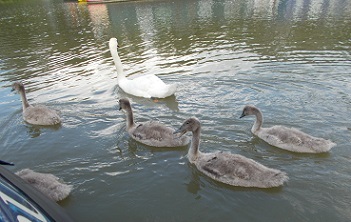 and a proud Mum and Dad often brought their babies alongside our boat as if to show them off. This entry was posted in blogging, Challenge and tagged Mindlovemisery’s Menagerie, Tale Weaver. Bookmark the permalink. So wonderful. Nature indeed is beautiful and tenacious. 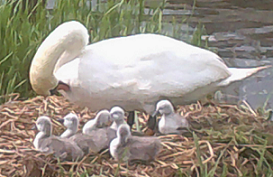 So graceful and serene……….. until you get too close to the babes, unless of course it’s on their terms!